Latest Update : 12.11.2013 - Internal Assessment Report for First Year Students : For First Year Students, 3 Attendance Reports and 2 Internal Assessment Reports are already updated in COE Poral. But without Register number, first year students are not able to check their data upto yesterday. Now, 12.11.2013, AU-COE has generated the Register Numbers for First Year Students. So, Now the First Year Students Can Check their Internal Assessment Reports Immediately thru COE Webportal by click here. This Article will be very useful for the First Year Students and New Lateral Entry Students to know the details of COE Web portal. As of now, First Year Students and New Lateral Entry Students doesn't have register number to login this portal. But very soon those First Year Students and New Lateral Entry Students can get their Register Number from Anna University thru your College Exam cell. After that you can see the portal details as per the following demo. 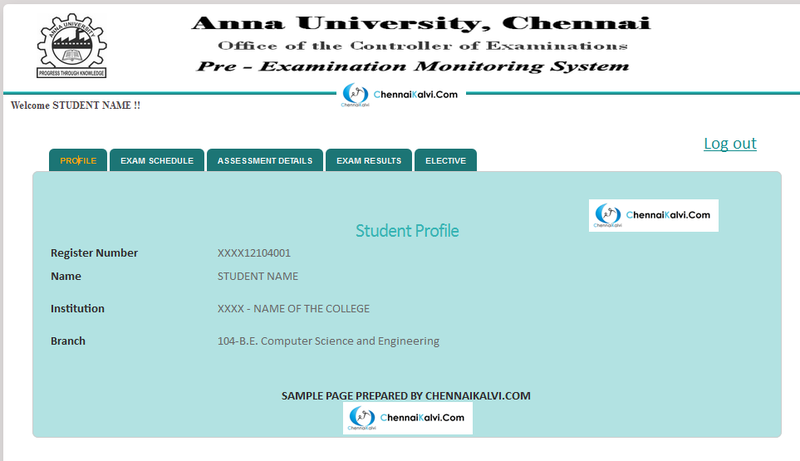 This Post is for Anna University Affiliated College Students who are not yet login their students Corner of "Anna University Pre - Examination Monitoring System"
Anna University Launched a web portal for Pre - Examination Monitoring System. This Portal is very helpful to student for the knowing many Students' related Activities. 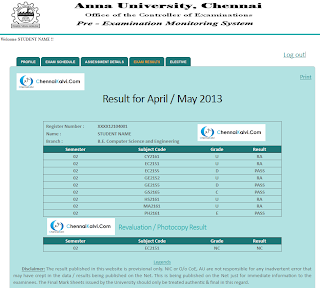 ChennaiKalvi.com is proudly presenting this demo for the students who are not yet tried this portal. 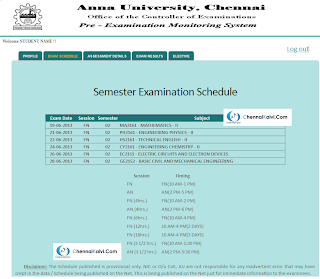 1. http://coe1.annauniv.edu is the Web Portal Address for Login Students or Parents to check the Students Attendance, Result and Exam Schedule Details. Here we must know the Students' Register Number and Date of Birth to Enter in the Web Portal for check the student details. 2 .Student's Profile - This is the First Page/Tab which can be seen at the time of login. Here the Name is very Important. 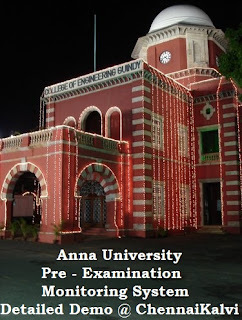 Students can check their Name and Initials has (without any spelling mistake) correctly registered with Anna University. So that students can directly approach their exam cell to change if there is any corrections on their name. This will be avoid the Name.Initial mistakes in University Mark Sheets and Degree Certificates. 3.Exam Schedule : This is the Second Tab. After Announcing the Exact Exam Timetable by University, no need to check the entire time table for your registered exams like current semester paper and Arrears Papers. All of your registered Papers with the exam date and time will be available on this page. 4.Assessment Details : This is the Third Tab. In this tab, Students / Parents can see All the Internal Assessment Marks (Monthly Exam Marks) and Regular Attendance Status of the Student. It will be updated every month by the colleges. 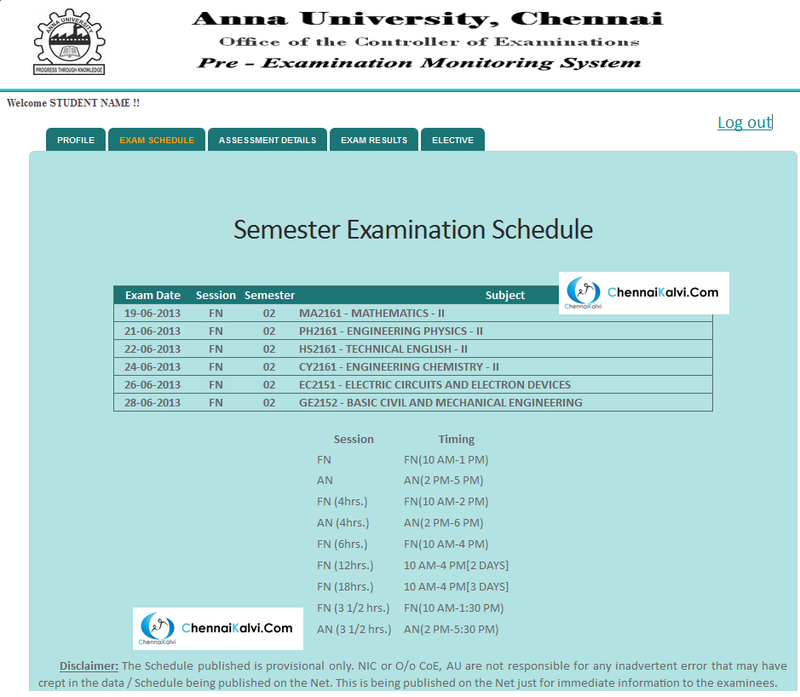 Note : To Avoid Web Traffic, Anna University will allow to see this page only between 6.00 PM to 7.00 AM. Other Times this page will not be available on Students Login. 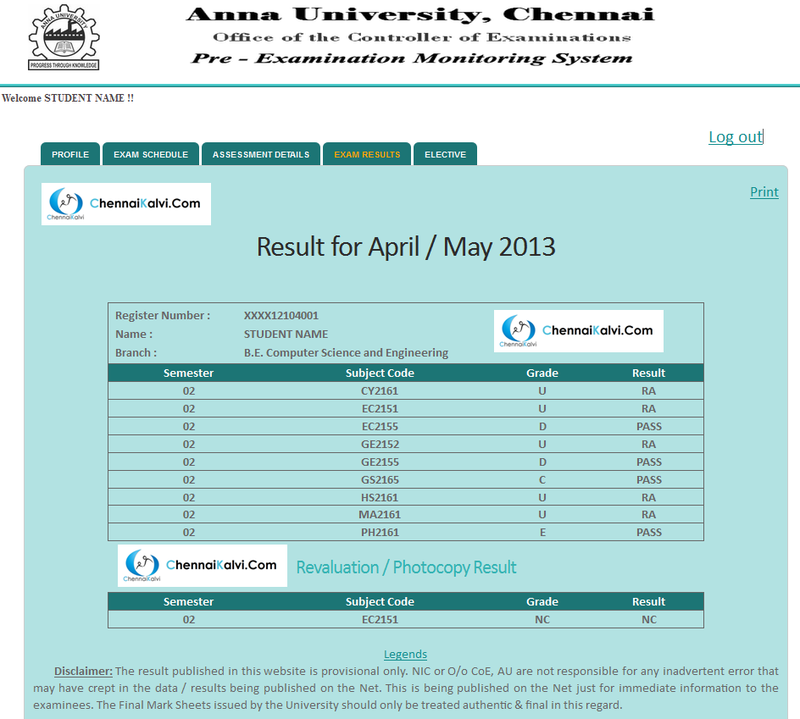 5.Exam Results : It is in Fourth Tab. Students or Parents can check the students recent University Exam Results and Revaluation Results after University Results publication. This results normally available upto the next semester Results. 6. Elective : Elective is the Last Tab. Here the Final Year Students can check their elective paper options. Note : ChennaiKalvi.com is the Only Website having this detailed Demo of this Portal. If you feel this article is useful, then share with your friends.